Mmmm rocky road ice cream. The chocolate. The marshmallows. 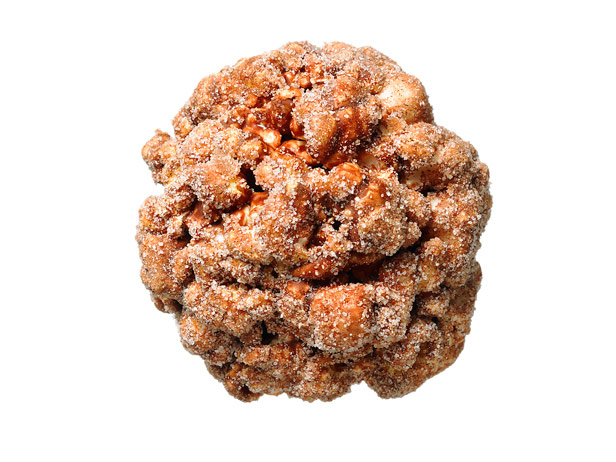 Oh and who couldn’t forget the sweet crunch of the nuts? Ice cream is a great inspiration of other desserts including cookies! So put down the spoon and have some rocky road with your fingers. Licking the melted marshmallows off your hands is completely expected and totally fine. Oooh did I mention this is a FLOURLESS cookie?! YUP! First, toast almonds if you do not have toasted almonds. To toast almonds, heat oven to 350ºF and place almonds on foil lined baking sheet and bake until golden, about 10 minutes. Preheat oven to 350ºF (if you already had toasted almonds) and line 2 baking sheets with parchment paper. Set aside. In a large bowl sift powdered sugar and cocoa powder. Whisk in salt. Add egg whites and vanilla and whisk until combined and batter is smooth. Using a medium size cookie scoop, portion out 12 cookies on each baking sheet. Place 4-5 marshmallows on top of each cookie. Place the baking sheets in the freezer for 5 minutes (or fridge for 10-15 minutes) to chill cookies to prevent them from spreading too much in the oven. Bake cookies for 12-13 minutes. Allow to cool on the baking sheets for at least 5 minutes and then transfer cookies to wire rack to cool completely. To start the brownies, Preheat the oven to 350°F. Grease a 9 by 13-inch baking pan. Using a double boiler, heat the coffee, margarine, and dark chocolate, stirring, until the chocolate is melted and the ingredients are thoroughly combined. In the bowl of a stand mixer, combine the sugar, cocoa powder and salt and mix together with the paddle attachment. Add the oil, water, and vanilla and mix to combine. Add the coffee mixture and mix to combine. 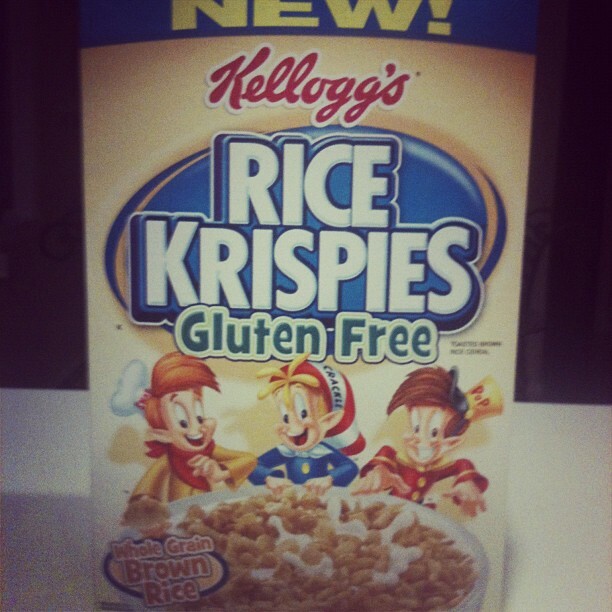 In a separate bowl, mix together the gluten free flour and baking powder. Stir in the chocolate chips. Add the dry ingredients to the wet ingredients and mix until all the ingredients are incorporated. Pour the batter into the prepared baking pan and bake for 45 to 55 minutes, until a toothpick inserted in the center comes out clean. Cool completely, then cut into squares. 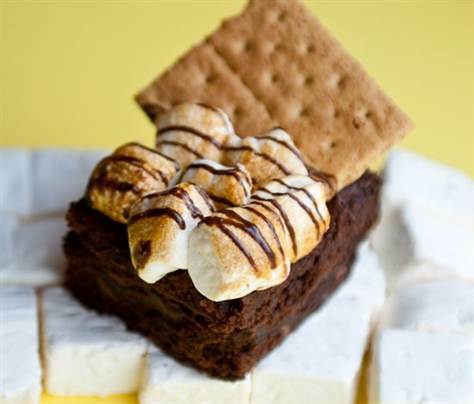 To assemble the s’mores, Once brownies are cooled and cut, melt 1/2 cup of chocolate chips in a microwave. Drizzle the melted chips over the brownies. 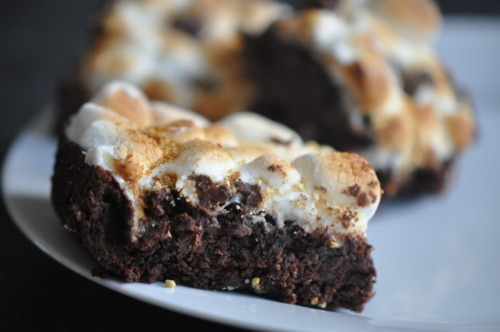 Pile the marshmallows onto the brownies, on top of the melted chips. Using a pastry torch, flame the marshmallows until you get some browning, being careful not to burn them. Sprinkle the remaining chips on top. 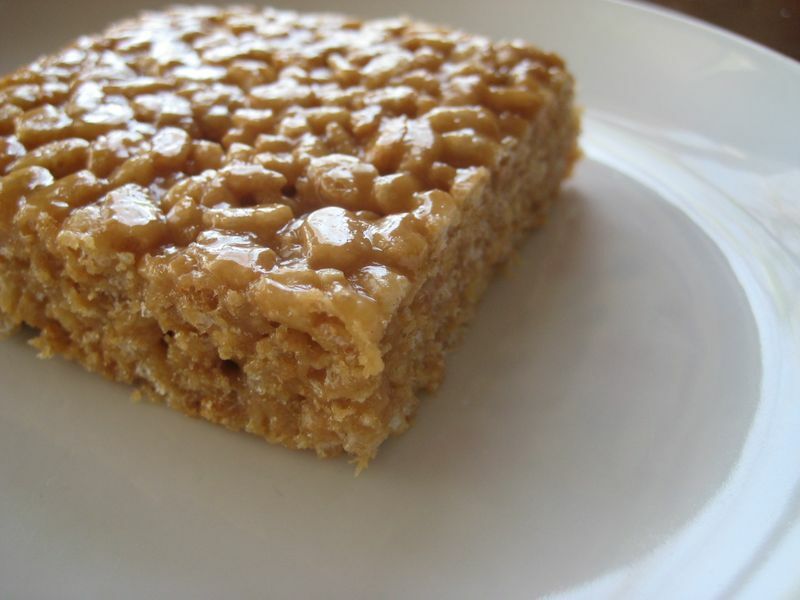 Break the graham cracker squares in half and press them into the marshmallows so that they stand upright. Or, simply crush them in a plastic bag and sprinkle them over the top. I was thinking about taking a trip to Azure Chocolat sometime this week because I need some marshmallows dipped in chocolate. They MAKE their own marshmallows! MAKE THEM FROM SCRATCH! Why the caps? BECAUSE THEY ARE DELICIOUS! AND DIPPED IN CHOCOLATE! Made from scratch marshmallows with a hint of rose dipped in delicious chocolate. 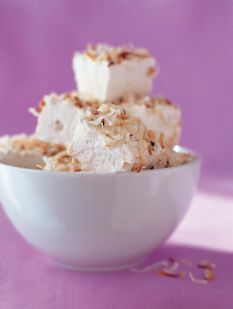 But, if you don’t live on Long Island and cannot get to Azure Chocolate (I’m sorry), you can make your own marshmallows. Marshmallows are pretty easy to make and they can be a vehicle for a lot of great taste. While I may not make them as good as they do at Azure Chocolat, these can come pretty close. Meanwhile, combine the sugar, corn syrup, salt, and 1/2 cup water in a small saucepan and cook over medium heat until the sugar dissolves. Raise the heat to high and cook until the syrup reaches 240 degrees F on a candy thermometer. Remove from the heat. 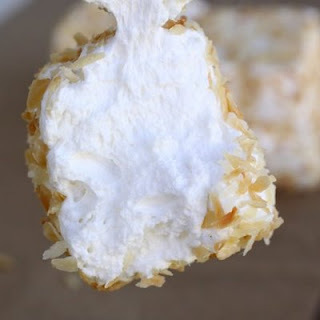 Sprinkle half the toasted coconut in an 8 by 12-inch nonmetal pan. Pour in the marshmallow batter and smooth the top of the mixture with damp hands. Sprinkle on the remaining toasted coconut. Allow to dry uncovered at room temperature overnight. 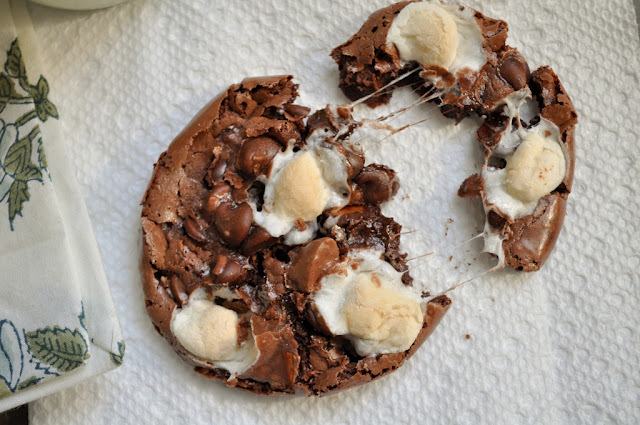 FINALLY I a yummy cookie pizza recipe using gluten free rice chex! Here is a sweet pizza treat that is fun to decorate and eat! You can use your favorite candy to decorate your pizza! 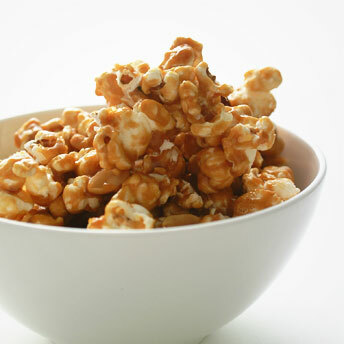 Use different chocolates, nuts and miniature candy bars to make it just the way you like it! Heat oven to 375°F. Place cereal in resealable food-storage plastic bag; seal bag and crush with rolling pin. In large bowl, mix sugars, peanut butter, butter, vanilla and egg. Stir in crushed cereal. Spread in ungreased 12-inch pizza pan. Bake for 12 minutes. (You want to watch the crust because if its overcooked it will be very crunchy! Sprinkle evenly with marshmallows to within 1 inch of edge. Bake 5 minutes longer or until marshmallows are light golden brown. 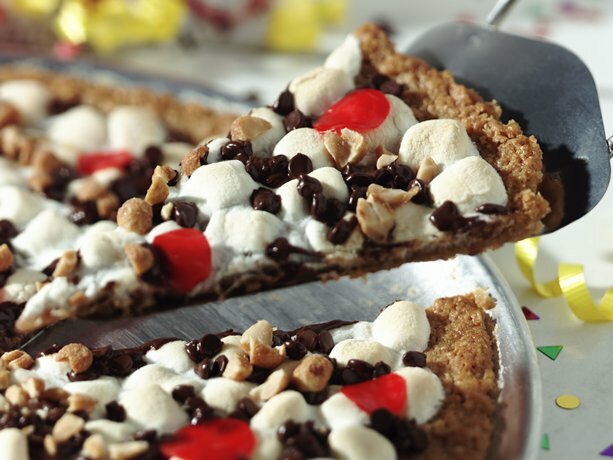 Sprinkle chocolate chips, peanuts and fruit snack pieces over marshmallows to look like pizza toppings. Cool completely on cooling rack. Cut into 16 wedges. Store tightly covered.